After a disappointing third film, can anything still save Superman? Superman IV sees Superman tackle the nuclear arms race and in doing so accidentally creates Nuclear Man, a nemesis of equal strength to him. With Superman on the brink of death, Nuclear Man’s master, Lex Luthor, puts the world’s safety at stake for financial gain. From the off, Superman IV is obviously not a child of its direct predecessor: gone are the unnecessary comedy sketches, replaced by more up to date matters such as the desire by some for Superman to rid the world of all nuclear weapons. Up to this point, the franchise hasn’t touched on any real world issues so this inclusion is a nice side-step handled well by Reeve, who portrays Superman and Clark confidently, trying to find a suitable answer to the young boy’s question. The result is Nuclear Man; his inclusion creates some great action sequences, not least when the Statue of Liberty is used as a play-thing between the two super beings. It does seem however that the makers of the film didn’t want to indulge in an interesting Nuclear Man character as, when not destroying things, he mostly growls and looks moody. Nuclear Man’s character is dispelled partially by Gene Hackman returning to his role has Lex Luthor. Hackman is as charismatic and devious as ever, a highlight being when he talks to three dangerous arms dealers and persuades them to do his dirty work. Hackman has always been the perfect counter balance to Reeve’s Superman, as although they both strike the same light hearted key, Reeve’s straight faced hero is aided by the entertaining humour and personality of Hackman. The film’s main flaw comes from Nuclear Man’s lack of character and easily exploitable weakness which, although entertaining, leave the action scenes unsurprisingly quick for Superman to manage. Another oddity is Superman’s romantic flight with Lois which seems out of place – this must have been included to relive the magic of the first film. 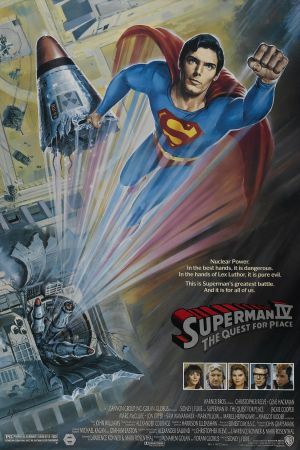 Superman IV: Quest For Peace, does a lot which is right: the action sequences are good, the politics of the arms race are fitting and the usual characters are pitch-perfect. However due to its new villain choice and short running-length, it doesn’t quite bring back the glory days of Superman I and II.